After a few failed attempts at meeting one another due to our hectic schedules, Hayley Elsaesser and I had finally connected during last week's Toronto World MasterCard Fashion Week. I was beyond stoked - almost like a giddy school girl! It was such a genuine pleasure to personally connect with her as opposed to electronically. She's beyond dope! Hayley Elsaesser is an eclectic Aussie gem and Canadian-based contemporary fashion designer for the luxury streetwear market. She debuted her second World MasterCard Fashion Week show in Toronto, where she revealed her Midnight Cowboy-inspired collection on the runway. 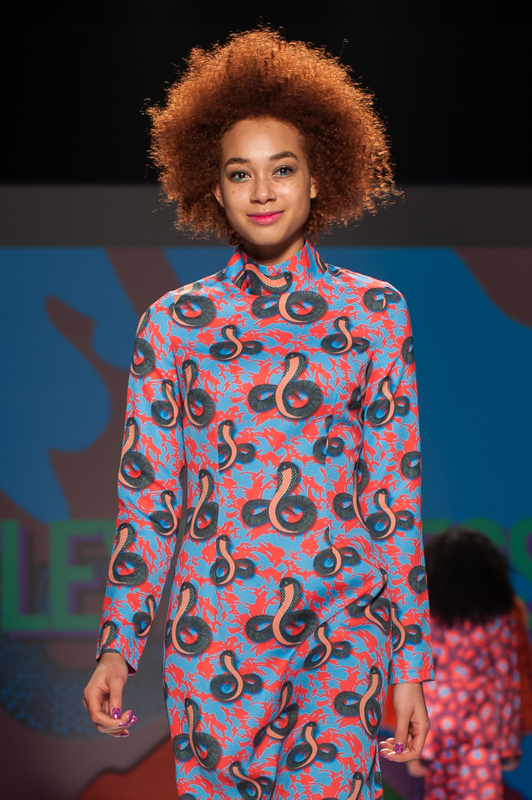 Elsaesser’s vibrant fall/winter 2015 collection showcased neon camouflage and animal prints, vibrant orange and lime-green furs and her signature snake graphics. Not only was her collection loads of fun, so was her runway music selection. It had the crowd moving in their seats! Elsaesser is known for her bold and luxurious fabrics and prints. Her animated eight ball graphic wearing a blue cowboy hat, contrasted well with the red, purple and green cheetah print bomber jacket. It was definitely a crowd favourite and personally, a must have! “My mind is crazy enough as it is so believe it or not, my ideas come completely sober!” she said jokingly. For this collection, Elsaesser experimented with intarsia knit for the first time, which resulted in an ultra-cool, multi-coloured camo print set. In addition, this was also her first collection incorporating menswear. Being a left-wing realist (so to speak) as the creative director of her brand, Elsaesser put on a beautiful and fun show, showcasing models in various shapes, sizes, and ages. Being that her aesthetic speaks to the luxurious streetwear market, she casted talent from local street kids to modern hipsters, and from friends to legitimate models. “For all the designing and casting, I do that myself,” she said, but for added street cred, she called upon Toronto-based stylist to help pull her runway looks together by mismatching pieces from her entire collection. “I have a stylist who helped style the runway and the look book and that's Romany Williams. She helped me pull it all together!” she said. Elsaesser's attention to detail certainly doesn’t go unnoticed — the neon hair extensions and pop nail art contrasted well with the entire collection. When asked about the future of her brand, her response was much needed rest. Hayley Elsaesser’s collections will be available online and in a select few Toronto shops and boutiques.